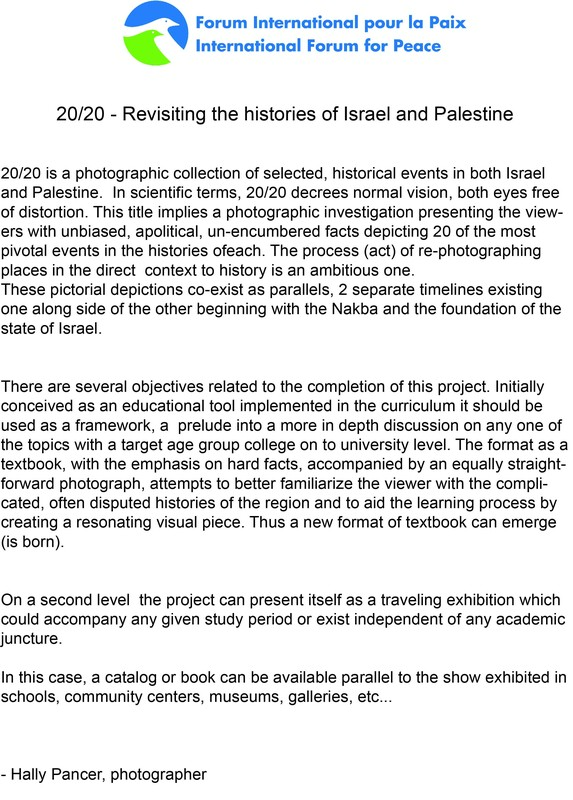 20/20 is a photographic collection of selected, historical events in both Israel and Palestine. In scientific terms, 20/20 decrees normal vision, both eyes free of distortion. This title implies a photographic investigation presenting the viewers with unbiased, apolitical, un-encumbered facts depicting 20 of the most pivotal events in the histories ofeach. The process (act) of re-photographing places in the direct context to history is an ambitious one. These pictorial depictions co-exist as parallels, 2 separate timelines existing one along side of the other beginning with the Nakba and the foundation of the state of Israel. There are several objectives related to the completion of this project. Initially conceived as an educational tool implemented in the curriculum it should be used as a framework, a prelude into a more in depth discussion on any one of the topics with a target age group college on to university level. The format as a textbook, with the emphasis on hard facts, accompanied by an equally straightforward photograph, attempts to better familiarize the viewer with the complicated, often disputed histories of the region and to aid the learning process by creating a resonating visual piece. Thus a new format of textbook can emerge (is born). 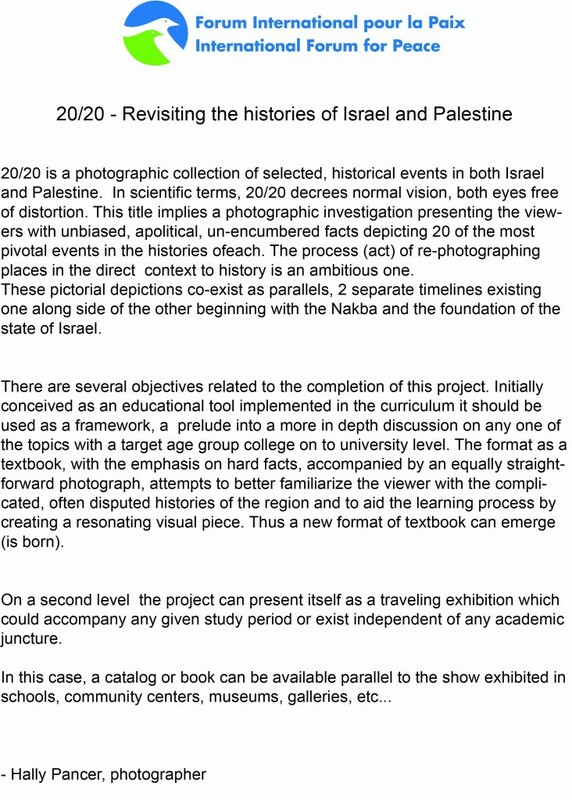 On a second level the project can present itself as a traveling exhibition which could accompany any given study period or exist independent of any academic juncture. View all posts by International Forum for Peace. This entry was posted in News. Bookmark the permalink.